Home DIY Projects	Free Chandeliers!! Happy Wednesday, my friends! Remember a few years ago I did one of my first blog posts entitled, “My Name is Jimmy”? Well, as the old saying goes, when someone offers you something for free you say, “My name is Jimmy, I’ll take what you gimme.” So, when someone offers me free chandeliers? Call me Jimmy. By now, most folks who know me will agree I have a slight chandelier fetish. I agree and I’m fine with it. If I run across a chandelier at a great price, a trash pick or someone offers one up for free, I’ll take it. Personally I don’t need any more chandeliers, unless we buy another house, which is unlikely. So, now I keep an eye out for friends and family. Who knows, maybe one day I’ll open my own lighting store? When a kind neighbor recently offered to give me not one, but three amazing light fixtures, of course I said YES. My neighbor, Robert, who also happens to be our electrician, installed the crystal chandeliers in our new house. He mentioned he had replaced several chandeliers in his own house recently. The lights he removed were very heavy and high end fixtures, just not his nor his wife’s cup of tea. They were too nice to trash so he stuck them in his attic. Until yesterday. Robert texted me a picture of the light fixtures since he knew it was my “thing” to revamp and reinvent lights. I drove over yesterday and picked them up. They are indeed quite heavy and substantial. You can see the three fixtures take up the better half of my car. Free is my favorite price. Even better than $20. So now, I’m thinking that this fixture will look better in my sister’s master bedroom rather than one I was going to redo. First of all, this one doesn’t need to be rewired so this is already a cost savings. 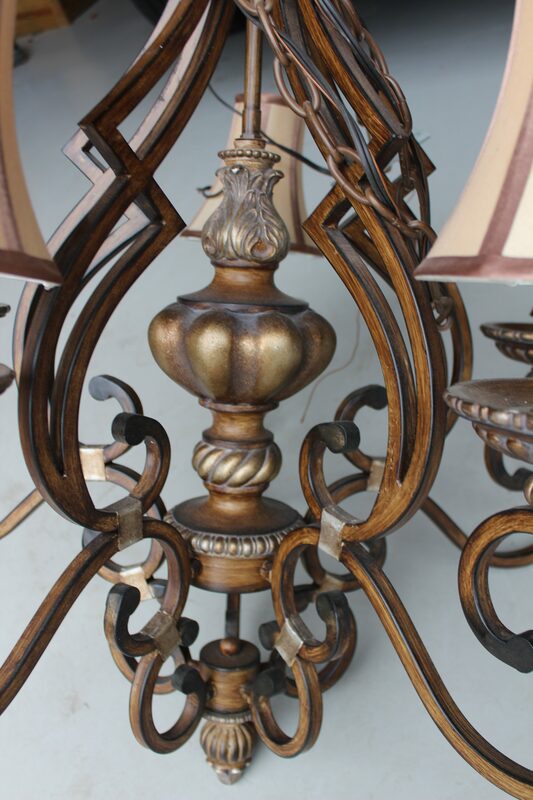 Just take a look at the beautiful details on this chandelier! Here’s my new plan: To transform the chandelier into an elegant bedroom chandelier for my sister, I’ll paint it black and liberally rub antique gold Rub ‘n Buff over the entire piece. And naturally add a few crystals. I’m one of those people who don’t mind seeing a light bulb, so I will remove the shades altogether. Can you imagine it? An antique gold leaf chandelier with crystals hanging from a beautiful tray ceiling? Twin Beds in a Small Room! How to Hardwire a Plug-in Chandelier!